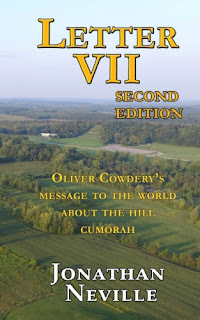 Since I published my commentary on Letter VII (Letter VII: Oliver Cowdery's Message to the World about the Hill Cumorah, here), there have been several efforts to persuade members of the Church to disbelieve what Oliver Cowdery wrote about the Hill Cumorah being in New York. Before I get to the objections, consider these aspects of Oliver's letters. Part of Letter I is included in the Pearl of Great Price. Oliver's letters give us the first quotations of what Moroni told Joseph. They give us the first account of John the Baptist conferring the Priesthood. They give us the first detailed accounts of most of what happened when Joseph found the plates. They were written with Joseph's assistance and reproduced multiple times in Joseph's day at his personal direction. Until I started encouraging people to read Letter VII, the main objection to these letters came from anti-Mormons who said Joseph and Oliver made up everything so we shouldn't believe these letters or anything else Joseph and Oliver wrote. Some anti-Mormons used the letters to show how LDS scholars themselves repudiate Joseph and Oliver (and their successors). Now, we have LDS scholars and educators telling us not to believe the letters because of the New York Cumorah statements in Letter VII. They even reject what Oliver said Moroni told Joseph Smith. We've actually reached the point where the anti-Mormons and Mesoamerica-promoting LDS scholars agree that Oliver and Joseph didn't know what they were talking about with respect to these letters. Remember that as you read these objections related to me by Mesoamerican promoters. The Objections to Letter VII. 1. The first objection is that Joseph and Oliver never had a revelation about the Hill Cumorah. This one relies on a couple of logical fallacies, but at its heart is the idea that Joseph and Oliver were merely speculating about the location of Cumorah, that they were wrong, and that they thereby misled the Church for a century, so much so that every one of their contemporaries, including all of Joseph's successors as Presidents of the Church in the 19th century at least, were misled by Letter VII. I don't find that persuasive in the least. But the logical fallacies show why the argument doesn't hold up. First is the self-evident fact that we don't have records of everything Joseph and Oliver said and did. The most we can say is that we do not have a record of a specific revelation that the Cumorah of Mormon 6:6 (the site of the Nephite records repository) was in New York. But because we don't have a record doesn't mean it didn't happen. We do have Letter VII; what we don't have is a separate document specifically explaining the factual background for what Oliver wrote about Cumorah. 3. Another objection is that Letter VII has not been quoted in General Conference. I haven't taken the time to verify that, but I've pointed out on this blog that as recently as 1975, President Romney of the First Presidency, in General Conference, spoke about Cumorah (in New York) as the scene of the final battles. Three years later, Elder Petersen of the Quorum of the Twelve did likewise. So the follow-up objection is that none of the current members of the Twelve and none of the current First Presidency have quoted Letter VII in General Conference, and no Presidents of the Church have done so in General Conference while they were President. (Being President of the Quorum of the Twelve doesn't count, if you're Joseph Fielding Smith; you have to restate it a third time during the 18 months you are actually President of the Church for you to be credible and reliable, even though you quoted it specifically as a 20-year Apostle and Church Historian, and repeated it 20 years later as President of the Quorum of the Twelve, because those two times don't count.) Therefore, we can't rely on Letter VII or any prior statements about Cumorah being in New York. This is a fascinating objection. It would mean that we should not be reading, let alone relying on, anything said in General Conference prior to the current Q12 and 1P, except for talks given by Presidents of the Church. No more Neal A. Maxwell. No more J. Reuben Clark. No more... well, you get the idea. If people want to take that position, fine. But I can't make sense of it. This is not a one-off oddball theory, but a frequently published and discussed teaching that originated with Oliver Cowdery, at least, and part of the set of letters specifically endorsed by Joseph Smith. 4. Another objection is that there was a typo in Letter III that Oliver corrected in Letter IV. In Letter III, Oliver had referred to Joseph's age as being in the 15th year. In Letter IV, he wrote, "You will recollect that I mentioned the time of a religious excitement, in Palmyra and vicinity to have been in the 15th year of our brother J. Smith Jr's, age-that was an error in the type-it should have been in the 17th.-"
It's difficult to imagine how correcting a typo in one letter means we should disregard the letter that contained the typo, let alone all the rest of the letters. If anything, the correction of this typo shows Oliver's attention to detail and his desire to be as accurate as possible. Besides, when Winchester reprinted the letters in the Gospel Reflector, he corrected the obvious typo in Letter III and omitted Oliver's reference to the correction in Letter IV. Don Carlos Smith, who republished the letters in the Times and Seasons in 1840-41, changed Letter III to read "the thirteenth year" but left the correction in Letter IV the same as I've shown above, an odd detail for sure. The Prophet followed the Winchester versions of both Letter III (June 1, 1844) and Letter IV (June 8, 1844). Related to this objection is the alleged problem that Oliver seemed to be referring to the circumstances leading up to the First Vision when he was actually describing the circumstances of Moroni's visit, and that Oliver gave a different reason for Martin Harris' visit to New York with the so-called Anthon Transcript. In the first place, Joseph's well-known accounts of the circumstances leading up to the First Vision postdated these letters. (He did write a preliminary version in 1832 that barely touches on the circumstances.) IOW, this is the earliest account of those circumstances. In the second place, Oliver learned about these circumstances from Joseph; if there are mistakes, they can hardly be attributed to Oliver who expressly relied on what Joseph told him (and on other documents we don't have today). Historians who claim the dating is wrong rely on an incomplete record anyway; Dr. Lamb may have made unrecorded visits to the area. Oliver was aware of the difference between fact and conjecture, as he explained throughout the letters. He was also aware of the difficulty of relating details exactly. In Letter VI, Oliver wrote, "I may have missed in arrangement in some instances, but the principle is preserved, and you will be able to bring forward abundance of corroborating scripture upon the subject of the gospel and of the gathering. You are aware of the fact, that to give a minute rehearsal of a lengthy interview with a heavenly messenger, is very difficult, unless one is assisted immediately with the gift of inspiration." IOW, Oliver was relying on Joseph's memory, or possibly documents we don't have now (as Oliver claimed he did). Some parts of these letters involve events that occurred before Oliver got involved, for which he had to rely on what Joseph told him. But the parts of the letters that relate Oliver's own experiences he characterizes as fact. This includes the Letter VII descriptions of Cumorah, which Oliver knew from his own experience was in New York, as related by Brigham Young. Another related observation involves Letters I and II. Historians note that Letter I seems to be introducing the First Vision, while Letter II skips that vision and goes right to the visit of Moroni. One author proposes that Joseph Smith asked Oliver not to discuss the First Vision, which seems reasonable to me. Here's the link. The point is not that Oliver was loose with the facts, but that he changed course for an unexplained reason. I think this shows how closely Joseph and Oliver worked together, especially when Joseph's eventual explanation of the First Vision adopted some of Oliver's commentary. 5. Yet another objection is that you can't resolve Book of Mormon geography by referring to a single anecdote in Church history. That is axiomatic, and no one I know of claims otherwise, certainly not me. However, an extensive, detailed discussion of the final battles at Cumorah is hardly an anecdote. This is an explicit statement, officially republished many times for nearly 100 years. Second, I don't think Letter VII resolves anything because people are free to believe it or not. Third, Letter VII only establishes the New York location of Cumorah for those who trust Oliver (and Joseph, who helped write it and endorsed it multiple times). It says nothing about a limited or hemispheric geography. People are still free to believe whatever they want about geography. 6. Another objection is that Joseph let mistakes go without correcting them, such as the statement in the April 15, 1842 Times and Seasons that it was Nephi instead of Moroni who visited Joseph Smith. Maybe Joseph didn't care about the error, or maybe he didn't notice it. (I think this is evidence that Joseph wasn't editing the Times and Seasons by this point, so it has nothing to do with his oversight.) There was another error in the Book of Commandments regarding a date on one of the revelations that Joseph supposedly reviewed but didn't bother to change. Again, maybe he didn't care about such details, or maybe he didn't notice, or maybe he forgot the original date. But those one-word details hardly compare with Letter VII's extensive and detailed description of the Hill Cumorah and the final battles, especially when Joseph specifically endorsed the letter multiple times and mentioned Cumorah in D&C 128 in connection with other events that took place in New York. 7. An objection related to the first one is that Joseph adopted a false tradition started by unknown persons at an early date. True, there were things that Joseph believed at one time that he later changed his mind about, such as phrenology. He didn't object to smoking tobacco until he received the Word of Wisdom. He may have given bad medical advice. But these are peripheral matters compared with the location of Cumorah, and there are no accounts of him changing his views on Cumorah. Nor did any of his contemporaries, all the way through the 1879 footnotes in the Book of Mormon. In Feb. 1844, Oliver's letters were published as a pamphlet in England. Later that year they were published in New York in The Prophet. There is no hint of opposition by Joseph to the contents of Letter VII or the other letters; instead, portions of Letter I were canonized in the Pearl of Great Price. It's true that Letter VII was not canonized, but does that make it a false tradition? In my view, it does not. We have lesson manuals full of the teachings of Joseph Smith that were never canonized. 8. The final objection I'll address here is the idea that maybe this was Oliver's statement on his own, without input from Joseph. People forget that Oliver was the Assistant President of the Church when he wrote Letter VII. I've gone through his qualifications before. A few months after writing Letter VII, he and Joseph received the Priesthood keys from Moses, Elias and Elijah in the Kirtland temple, along with the visitation of the Lord Himself. Even assuming Joseph didn't tell Oliver to write about Cumorah, Oliver is independently a credible, reliable and personal witness of these events, which is why Brigham Young and others relied on what he said about the repository. Not to mention, we all rely on Oliver's credibility and reliability as one of the Three Witnesses (and the translation, and John the Baptist, Peter, James and John, and so much more). When people choose to single out Letter VII as Oliver's one big falsehood, a statement of fact that was not actually a fact, and they do so purely because they disagree with Oliver, I don't find that a persuasive argument. To review: there are two basic reasons to reject what Oliver Cowdery wrote about Cumorah in Letter VII. First is the basic anti-Mormon reason, that Oliver made the whole thing up, conspiring with Joseph to deceive people, so everything in his letters is false. Second is the position of those who object to Letter VII because they object to the New York Cumorah because they believe a theory of Book of Mormon geography that is inconsistent with the New York Cumorah; i.e., they disagree with what Oliver wrote, and isolate the Cumorah issue as the one falsehood he wrote because it contradicts what they prefer to believe about Cumorah. Of course, people can believe whatever they want. I'm perfectly fine with that. I just want to clarify the issues for those who read Letter VII so people can make informed decisions about whether or not to accept what Oliver wrote. When the only reason a person rejects Letter VII is because he/she disagrees with Oliver Cowdery's statement about Cumorah, I find that puzzling to say the least. For me, it's an easy choice. On one hand, we have people living in the 21st century who think they know more about Cumorah, the plates, and all the circumstances of the translation and interaction with angels in New York than Oliver did because of what they've read. On the other hand, we have Oliver, who was there when Joseph translated, who handled the plates, who saw the angels, who had been in the repository of Nephite records in the hill in New York, and who collaborated with Joseph on these letters. I think I'll go with that guy.